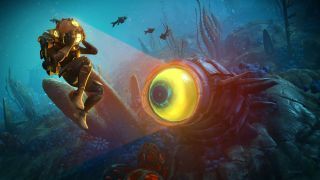 No Man's Sky creator teases a new game that's "big, ambitious, and silly"
On the heels of No Man's Sky's big NEXT update, developer Hello Games is hard at work on a VR version of its galactic explore-'em-up. But as we learned in a recent talk with studio founder Sean Murray, Hello Games also has something totally new in the works. "We're still excited about No Man's Sky and about working on it, but we are doing other stuff as well," Murray said. "We're doing The Last Campfire, which is a smaller side-project. We're also starting on something new – which is big, ambitious, and silly. But we're still a very small team. We do quite a lot between us, but I think that's because we are all so into it. And we, now, sort of do things because we are excited about them. We tend to be quite productive when we are excited about something. That's genuinely where we're at now." With No Man's Sky's rocky days well behind it, Hello Games is now free to try weird passion projects - not unlike No Man's Sky VR, which even Murray said is "not a commercially driven idea." The Last Campfire, a "Hello Games short" about some cute little adventurers lost in the wilderness, is a direct result of that freedom. I'd love to see the studio take the same approach to something bigger, and the stranger, the better. Hello Games' to-do list is getting long, so whatever this new mystery project is, we probably won't hear much about it for a while. And where the studio called The Last Campfire a "short," Murray explicitly said this new project is big and ambitious, so we probably won't play it anytime soon either. Here's everything that's going on with No Man's Sky Beyond, a three-part expansion to the game's universe.